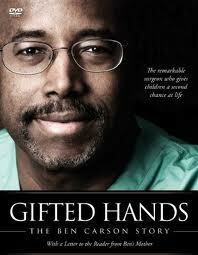 Gifted Hands, is the story of the renowned Dr. Ben Carson, who as a child grew up in Detroit, Michigan, with his mother and older brother; he had tremendous disadvantages. At one time, when he was young, he had the lowest grades in his class and worst of all he was the only black kid in that class. This gave his white classmates the opportunity to tease the hell outta him. Ben, a hot-tempered child, pounced on anyone that teased him to the last of his patience. This temper would have landed him in big trouble, but thank God, he escaped it. Ben’s mum was really an inspiration in Ben’s life. Her words molded him into the man he’s today. Were it not for her determination to see her boys not end up cleaning factories, Ben would have been a nonentity today. She was an angel sent to Ben to guide him along this journey called life. Though she was an illiterate, her words showed and proved that there was a power or force in her, bigger than what education could render; the wisdom of God. The world needs mothers like Ben’s mum. Below is an extract of the GIFTED HANDS movie I watched. 1987: This movie started with BEN preparing for an operation, with his favorite music playing in the background. After this, the parents of the unborn sesame twins that Ben would operate on were seated in their physician’s office to hear the result of the ultrasound that was done. The look on their faces showed despair as they just realized that they would be having an OCCIPITAL CRANIOPAGUS twins. Following this, Ben was seen in the operating room when he had a call from his senior colleague to see him after his (ben’s) operation as they had an important issue on ground. When they met, Ben’s senior colleague told him that he received a call from Germany, and that there is a case of an occipital craniopagus twins which were born 3 months earlier. So the hospital would like him(Ben) to go to Germany and examine them. Ben did go, and when he arrived, he met with the parents and physician of the sesame twins. Father of twins: Please don’t ask us to choose between them. Father of twins: So how soon would it be? Ben: Well, first we have to solve the problem of exsanguination (bleeding to death). 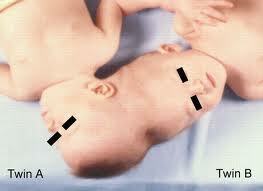 That is the reason why cranial separations haven’t succeeded. You see, babies have very little blood and unless I figure out a way from bleeding out, I can’t risk performing this operation. Ben went back to Baltimore, Maryland, to reminisce over the meeting he had with the parents of the twins before making a decision. Colleague: Good, thank you. i’ll notify the doctor in Germany, and we will schedule the operation for say a month from now? Colleague: you still haven’t figured out how to save them both, huh? 1961: This scene began with Ben Carson’s middle school teacher calling out the right answers of the test Ben and his classmates just had. Teacher: Alright class! Hand your tests back to your neighbor. Alright, how many did you get right Cathy? Teacher: Good for you mark. You got them all right. Benjamin? The bell rang, and everyone hurried down the hallway to their lockers. As Ben was dropping his book in his locker, some of his classmates came towards him to mock him. Male classmate: Hey Carson, you know you are the dumbest kid in the class but did you hear of Sonia last night on the news? She is the dumbest kid in the whole world. Next, he was seen in the principal’s office with his mum. Fast forward to where his mum was asking him about his grades. She said, “you aren’t meant to be a failure, Benny. And you can control your temper, and also bring your grades up. Ben: I can’t. I am dumb, mother! Next scene opened with Ben and his bro in the sitting room watching tv. And then, mother comes back from work, turned off the TV, and instructed them to go do their home work. Ben brings his assignment to his mum and asks her for help (Not knowing that his mum doesn’t know how to read). Mum: What don’t you understand? Ben: Like, all the words. Could you read this for me? Mum: Well, I don’t know how either, we are just gonna use our imagination. Mum: Of course you do. Listen to me, if I say, “once upon a time, there was a little blue mouse.” Don’t you see a little blue mouse? Fast forward to when Ben went to church with his bro, Curtis. The pastor on the pulpit, speaking with so much enthusiasm, narrated a story to the congregation. As he was on it, Ben imagined himself as the missionary doc in the story. This made him realize that he has an imagination. When he got home, he told his mum and his bro what happened to him during the service. Then his mum said: that’s good; that is your imagination Benny. Curtis: what? What do you mean? Curtis: do you want me to come with you? Ben: so you’re just gonna leave us alone? Mum: of course not. Sister Scott will come stay with you. For the meantime, I want you boys to do me a favor. I want you both to learn your times table. Fast forward to where Ben showed improvement in his studies. Teacher: I didn’t say you did. What’s your score? Ben: hey, what did you do that for? Curtis: what about everybody else? Curtis: you are crazy. I mean, this is crazy. Ben: what are we gonna do with our free time? Curtis: I don’t believe what you’re saying. How can we possibly survive without television? Wow!!! This woman is an inspiration. Ok guys, let me give you a run down of the lessons I got from this story. Lesson 4: you can do anything anybody else can do; only you can do it better. Lesson 6: we are all blessed with astonishing gifts and skills, just develop it. Lesson 8: mums are angels sent to guide us along this journey, called life. Lesson 9: take risks. even if you fail, at least you did something. It is better to make the wrong decision than to be indecisive. I hope you learnt a lot from reading this!